The new show at Carl Hammer, although ultimately disappointing, is interesting at first because all of the large format images by artist Eric Daigh are made with entirely with colored push pins. 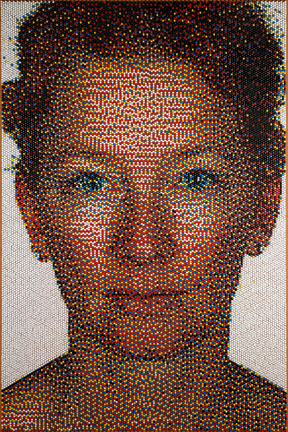 Red, Blue, Yellow, White and Black pushpins are used like points in printing or pixels on a computer screen to create portraits. These portraits couldn't help but reference the impressionists and Chuck Close, but the depth is more in line with what I would expect to come out of a BFA show rather than be in one of the better galleries in Chicago.